recommended for: Fans of John Green, Jay Asher, and other character-driven contemporaries. will i continue the series? : N/A, but I will re-read this again and again. All the Bright Places is a devastating, derailing book that shook me to my knees. It's the kind of book I wanted to reread as soon as I finished, the kind I'll return to years from now and remember as a dark night of the soul. I read it in a whirlwind two days. I couldn't start another book right after; I was still trapped in it, affected so deeply that the my first post-book act was to paint, because it was the only way to process. The characters invaded my head and took up residence there. Finch is remarkable from his first moment atop the bell tower. I fell for him, recognized myself in him in beautiful and terrifying ways. He's exaggerated enough to be literary, real enough to be recognizable. Violet didn't draw me as much, not at first, but her quiet suffering and flickering hope is a perfect complement to Finch's violent extremes. Their romance grows slowly, then all at once; it's achingly beautiful and complicated. Just as important is each character's inner battle. They fight some of it together, but in the end, it's a war they must win or lose alone. Told in arrestingly gorgeous prose, All the Bright Places is an artwork of a novel that tackles the most wonderful and brutal dimensions of love, mental illness, and growing up. Whether it leaves you with a clutching grief or a restless yearning to wander, it's a book that demands to be felt. 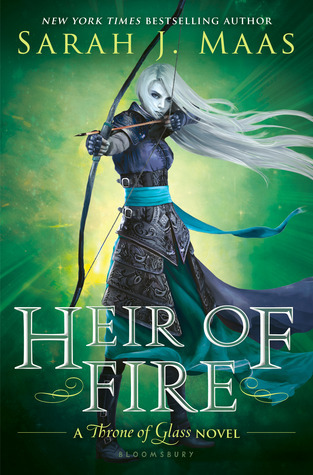 Ignore the comparisons to Green and Rowell; this is a book that stands alone, a book by which the genre of young adult contemporary can be measured. Boy meets girl rarely enjoys such a refreshing presentation. Finch and Violet meet atop the school bell tower, each struggling with hopelessness and contemplating the freedom of the fall. Spoiler alert: they don't jump. Instead, Finch becomes intensely fixated on Violet and determined to connect with her. Violet just wants to forget and nurse her grief for her dead sister, but Finch is not a voice to be shut out. Their becoming acquainted is forced and awkward, demanded by their school project, but you can feel the ties loosening in spurts of witty banter and moments of uncertain connection. Their adventures to strange Indiana places are entertaining, but the story gains just as much traction in their quiet conversations and inner monologues. Ever present are the unavoidable demands of family and the looming specter of an uncertain future, always with the undercurrent of Violet growing stronger, and Finch unraveling. It's a plot that enthralls and sneaks up on you, and doesn't let go. Mental illness has become a hot topic in young adult fiction over the last several years, but rarely have I seen it portrayed so accurately and poignantly. Finch and Violet are heartbreakingly recognizable--in myself, in people I've known. Their pathways of salvation and disaster are layered and all too realistic. This is not a transparent book. Niven doesn't offer platitudes on the power of love to conquer all or the ability of lovers to save each other. Her portrayal is raw, real, and whole. Her characters and their romance do not live in a microcosm of bliss. She explores the complicated family dynamics that shape Violet's and Finch's selves. She creates checkered portraits of well-meaning adults and clueless friends. She also unflinchingly explores the lies that people tell themselves and each other, and how these lies can turn deadly. In all of this, there's no obvious placing of blame or praise. Niven presents mental illness as it is: an affliction shaped by the people who witness it and the people who suffer it. She doesn't insult you with morals; she lets the readers make their own judgments. I'm only partly joking when I say that I want to marry Finch. He's exactly the kind of character I can fall for and feel kin to. He's a mix of frenetic joy and withering depression, a supernova light bulb trying to blow its own fuse. He's infinitely bizarre. His energy drives the plot, setting events in motion and jerking them along a crooked path. But he's not some manicpixiedreamFinch. His layers emerge over time, revealing a complex, tortured individual at war with himself. I could read a dozen books about him and never know him completely. Then there's Violet, whom, admittedly, I found a little boring at first. She's largely reactive--to Finch, to her parents--or purely avoidant. She feels inactive. The quality is important to her character's situation, but it also made it difficult for me to connect with her at first, particularly in comparison to Finch's easy knowable-ness. However, Violet does come into her own as the book evolves, as she demands control of her life and Finch becomes unknowable. I only wish there was a little more pure Violet-ness in Violet's sections, rather than Violet-with-Finch or Violet-with-Eleanor. Don't expect much of the side characters here. Violet and Finch are isolated in their own ways, and the few others are simply satellites circling their sun. Though part of me wished to know more about these people, particularly on Finch's end, the peripheral quality of the minor characters fit so well with the all-consuming universe that was Finch-and-Violet. I know I say this often, but I always truly mean it, and that is this: Niven writes the way I wish I could write. Not in exact wordings or idiosyncrasies, but in the beauty and energy injected into every phrase. The voices of her characters come through in a way that is real but amplified, an expression of teenage-ness stretched to its limits. Perhaps not many teenagers will quote Virginia Woolf or speak in the complexities that Finch and Violet do, but at the same time, I never doubted their authenticity. I also found myself lingering over Niven's words, re-reading immediately after I had just read, and dog-earring enough that my book doubled in width. She has a way of expressing a thing in words you'd never expect, perfectly, poignantly. She also uses her silences and her spaces as powerfully as her text. It's a wonderful example where story and craft are perfectly aligned. I think I'd given this a 4 originally, but now I can't remember why. The format of Niven's novel, alternating sections narrated by Violet or Finch, is an excellent method. It not only tells her story, but visually embodies it--there is Finch, and there is Violet, and there are pieces, important pieces, that occupy only one world. It never falls into the repetitive habit of some romances--he comments on a scene, she comments on a scene. You do get the multiple perspectives, but the story is always flowing, and there's always something new that you wouldn't find in the other narrative. And it makes the turning point of the story that much more brutal. 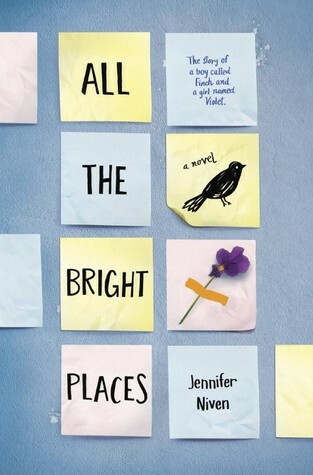 A devastatingly gorgeous novel that will haunt its readers, All the Bright Places has the potential to be a classic.